Came the idea of making a weekly post specially for tried and tested recipes. Thus, Friday Food Review begins from today! I shall be highlighting each and every recipe which doesn't belong to me but has been tried in my very own kitchen with U every Friday...so stay tuned! This recipe has been adapted from Myresipi, originally posted by maya_zakry and F&N. 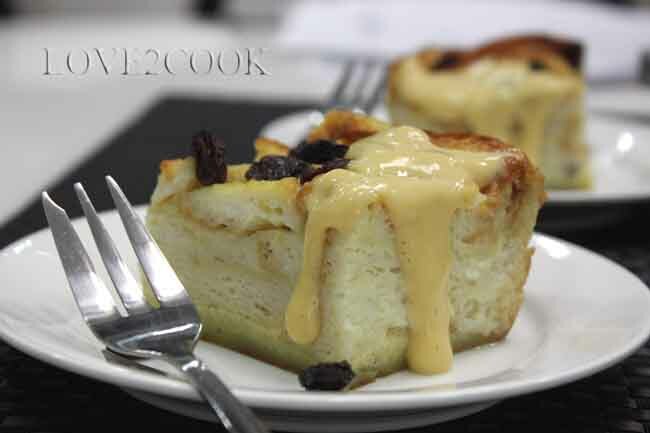 The pudding topped with custard sauce gives a great oomphh!!! U can have it chilled or warm, anyway U liked it. We had it warm. Gosh, I still drool thinking of it. The crusty edges of the baked bread, super yummy! Alright, shall we look into the recipe? Tear up the breads and arrange in a greased baking tray. Pour milk and let it soak for 30 minutes. Mix together ingredients (B) and pour over the soaked bread. Sprinkle raisins on top. Bake at 180 C for 30 minutes or until cooked. Let it cool at room temperature before chilling. To prepare the custard sauce - Combine all ingredients (C) in a saucepan and stir until slightly thickened over low heat. 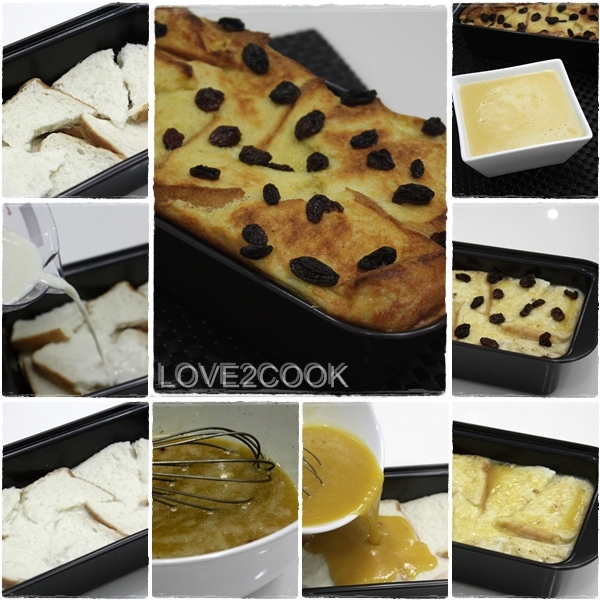 Pour over bread pudding before serving. *** U may skip the custard sauce and serve the pudding with ice cream...YUMMY! Umm divine looking pudding! So great it looks! Delicious pudding.. 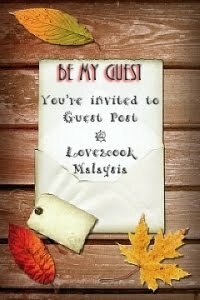 Wish I could have some..
samala macam saya.. list panjang...kikiki. 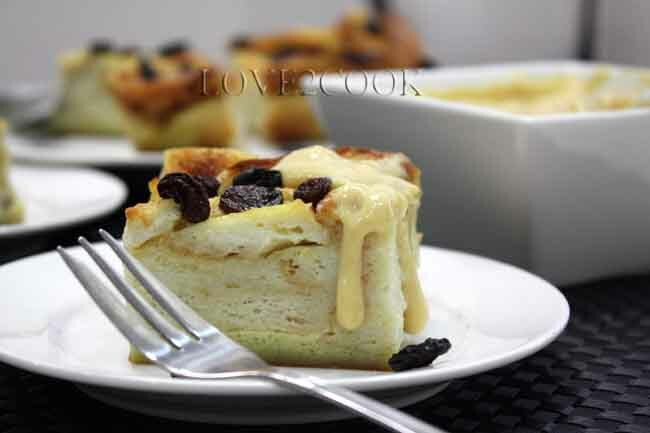 Ya, your bread pudding memang buat saya meleleh.. yumyum! Belum try lagi resipi ni. Masuk list dulu..tunggu beli roti dan susu. hihihi..
wow. i am drooling here...super clicks. btw, nanti try toast dulu bread tu....i tengok chef at home buat kat tv n tried it..lagi best rasa dia tau! Hi Love, what a lovely dessert you have there? Your picts look tempting and yummy...3 slices for me, sure licin...muaaahhh! Have a great weekend Love! 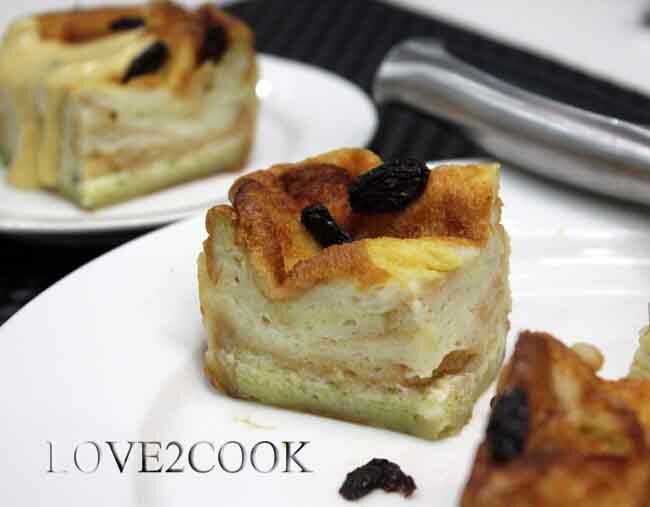 Hmm,,nice pudding dear.Congrats unga blog niraya food sites la feature aagirukku very good. Enna unga hubby naalaikku vara poerara nalla enjoy pannunga.. I am drooling myself as I am looking at those pictures. I am bookmarking this as well. Wow, yes, this would certainly be delicious with ice cream! Yum! 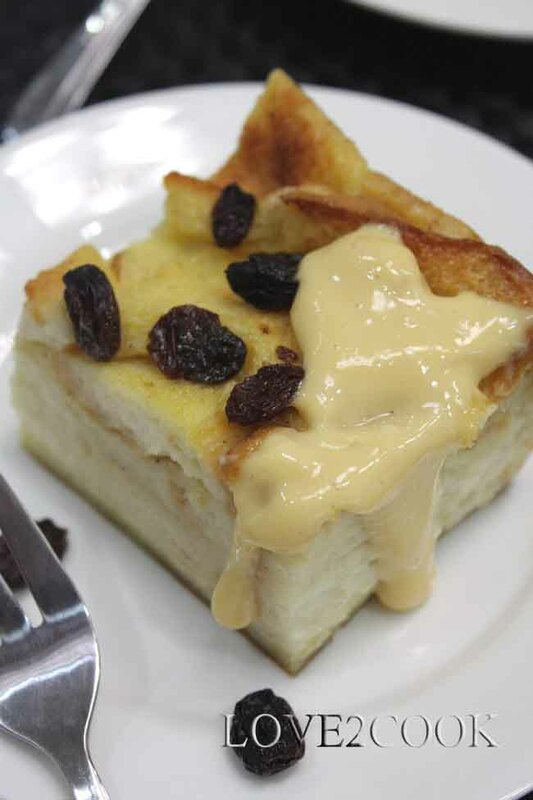 Woww stunning bread pudding,looks absolutely divine..
wahhh love, k.nor mmg antu sgt dgn puding roti tp k.nor suka yg suam2 panas. tak suka yg dlm peti ais.. makan lak dgn sos coklat.. yummy!!! This is so tempting, you have made them so perfectly...have a lovely weekend ms love..
Can't wait to dig in. I love bread pudding. Hah, sweet food, hmmmm, good dessert! Ce pudding de pain perdu doit être délicieux. Lovely presentation! Just love it. tak tahan melihat kesedapannya..hehehe..nmpknya, bhn2 asas dah ada, tinggal beli roti & susu je...esok nk wat la..biasa kukus je, tak pernah bakar...yumyum..
i pun buat last week guna resepi ni..setelah hampir setahun tak buat ni..huhu..siap bagi kawan2 ofis lagi tuk berbuka..hehehe..